As intimated earlier in the week, one of the more fascinating battles going on this week has been waged not between players, but between the media and the English language. This has entailed an exhaustive quest for original ways to describe the prevailing atmospheric conditions. Renae Stubbs found a way, though it didn’t necessarily lead to victory: ‘Can she survive in this heat, which is extraordinarily hot?’ Rhetorically, we might generously call this a polyptoton, although it would exhaust generosity to call it a good one. On the other hand, Serena Williams’ assertion that the Australian Open is ‘a great start to the beginning of the year’ is just a tautology. That’s okay – words are not her business. Her business is winning tennis matches. Thankfully Darren Cahill was on hand to explain in simple terms how she not only continues to do so, but is actually getting better at it, in clear defiance of her age. Today Williams faced Daniela Hantuchova, who several days ago achieved the rarest feat in tennis: prompting the commentators to add a new line item to her official fact sheet. In this case the new fact is that she can play the piano, an astonishing feat that was demonstrated to the gobsmacked Australian media several days ago, who summarily dubbed her ‘a concert pianist’. The fact sheet having been amended, there’s now a legal obligation to bring up her astounding musical prowess whenever she appears on screen. From today: ‘She’s so good at so many things: tennis, piano . . .’ The media love nothing more than celebrities – athletes, actors, US presidents – demonstrating hitherto unrevealed musical talents, no matter how meagre those talents truly are. The fact is, Hantuchova is a concert pianist in the same way that I am a professional tennis player. Youtube suggests her pianistic wizardry has been revealed many times before. For the record, Williams was out of sorts, but still won. Hantuchova played very well. Of course, supplementary talents don’t have to be musical. Anything not directly related to tennis will do, down to and including functional literacy. More than once I’ve heard Janko Tipsarevic called a ‘borderline genius’ because he has read Dostoevsky. Perhaps Benjamin Becker should try that, since the poor guy’s fact sheet hasn’t been updated in nearly eight years, and still only features two items. Firstly, he isn’t related to Boris (Boris confirmed this personally in the Australian Open’s draw ceremony). Secondly, he was the guy up the other end in Andre Agassi’s last match (Boris also mentioned this, amply fulfilling his ongoing commitment to supply no insight whatsoever). Speaking of Agassi, he’s back on Australian television screens this year, fulfilling his ongoing commitment to talk very slowly over thinly-disguised Jacob’s Creek commercials. The overall success of the campaign is apparent in this year’s expanded budget. This time the ads are shot on location, and feature an extended cast including Steffi Graf, Agassi’s brother Phil, his Dad Mike, and Gil Reyes (who was included last year, but this time has more to do). The glacial solemnity of the delivery and the intrusive soundtrack as ever lend Agassi’s inspirational words a slightly creepy edge. It’s no stretch to imagine the weapons-grade sentimentality of the opening film breaking tough prisoners at a secret torture facility. After that, however, something miraculous happens; the rest of the ads are actually pretty good. As far as I can tell they each reprise material already featured in Open, but that’s understandable; any anecdote worthy of a wine commercial shouldn’t be omitted from one’s autobiography. ‘Magic’, the fourth and final film, is a trifle overwrought, with a syrupy orchestral track and a ‘magic mountain’. This mountain is the one Agassi would famously toil upon in order to prepare for Australia’s cruel conditions, its magic evident in its efficacy. Few players have mastered those conditions more thoroughly. Thirteen years ago I watched Agassi run David Prinosil into the ground on a very hot Melbourne afternoon, until the German keeled over and couldn’t get up. Times were different, and I don’t recall that it was regarded as a moral issue. If Prinosil was still playing, no doubt it’d be on his fact sheet. For the longest time, networks kept their fact sheets safely out of sight, but no longer. Channel 7, in line with its ‘ongoing commitment to the evolution of tennis coverage’, has recently taken to sharing selected titbits before each match. A box pops up on screen, titled ‘Things You May Not Know’. For example, did you know that Sam Stosur loves to play ‘Bejewled Blitz’ on her phone? I hope not. Did you know that Hantuchova loves the film Gladiator? Of course you did: she’s a professional tennis player, and they all do. Apparently Benoit Paire is called ‘‘The Stork’ because he is tall and thin.’ Just in case you assumed it was because he is a qualified midwife. Last night he recovered from two sets down, running Nick Kyrgios into the ground on a very hot Melbourne evening. It was tremendous entertainment, initially contoured by the Frenchman’s forehand, which for long periods barely worked at all, and later by the Australian’s legs, which gave out entirely. Given his technical issues, it was a commendably patient performance from Paire, laced with just enough of his characteristic lunacy to keep things interesting. Kyrgios is the image of untrammelled youth on court, but afterwards was as gracious and thoughtful as you could hope for. Juan Martin del Potro last night contrived to lose to a laudably determined (and surprisingly inspired) Roberto Bautista-Agut. Del Potro was considered a pre-tournament favourite, or at any rate represented the sole reason to believe Rafael Nadal wouldn’t reach the semifinals unhindered. Nadal wasn’t significantly hindered by Thanasi Kokkinakis, conceding just eight games, although those eight games were accumulated with sufficient panache that Australians now feel some reason to maintain hope for the future, a rare sensation in these Tomic times. Andy Murray was completely untroubled by Vincent Millot, even, it turned out, when he trailed 1/5 in the third set. Roger Federer was imperious against Blaz Kavcic for two sets, then merely good enough for one more. The main interest, apparently, was that Federer was scheduled to play on Hisense Arena, the first time this has occurred since Gladiator appeared on DVD, to the collective ecstasy of both professional tours. Britain’s The Telegraph contended that this reflected Federer’s ‘current status among the also-rans of the top 10’, although they failed to address what this says about Murray, who as of the third round will have played on Hisense twice. Interviewed after the match, Federer gave every impression that he didn’t much care where he played, though the Hisense crowd couldn’t have been more delirious in their appreciation that he’d played right there in front of them. Gilles Simon followed up his complicated five set victory against Daniel Brands with another against Marin Cilic, all on a broken foot. Details have been slow to emerge, but it seems Cilic served for every set at least fifteen times, and that at one stage play was suspended when an escaped panther wandered onto court. Simon will next face Jo-Wilfried Tsonga. Florian Mayer beat Jerzy Janowicz in straight sets today, a stunning upset that more or less everyone expected. Janowicz’s form convinced no one this week, and after losing he conceded he hadn’t spent sufficient time on Magic Mountain, mostly due to injury. He struggled mightily in the heat, but insisted it was his own fault, an unpopular attitude that will certainly go unreported. Mayer will next face David Ferrer, whose quarter is so short on marketable quality that he has already played twice in Rod Laver Arena. It could be, per The Telegraph, that this merely reflects his exalted position among the elite, but I doubt whether anyone truly believes that. If he’d been drawn in the top half, one doubts whether he’d see the inside of Laver before the quarterfinals. He’d be confined to Hisense, in much the same way that Javier Piles once confined him to an extraordinarily hot ball-closet for shirking his piano practice. Or so it says on his official fact sheet. 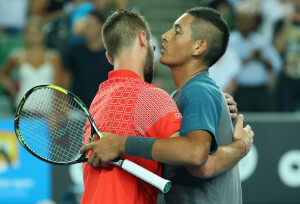 Always look forward to your write ups Benoit Paire and the midwife connection almost made me choke on my tea! Thank u for your wonderful writing. Hehe, my pleasure. Nadal should be fine from here, unless Monfils not only manages to do something spectacular (possible), but manages to do it for three sets (supremely unlikely).